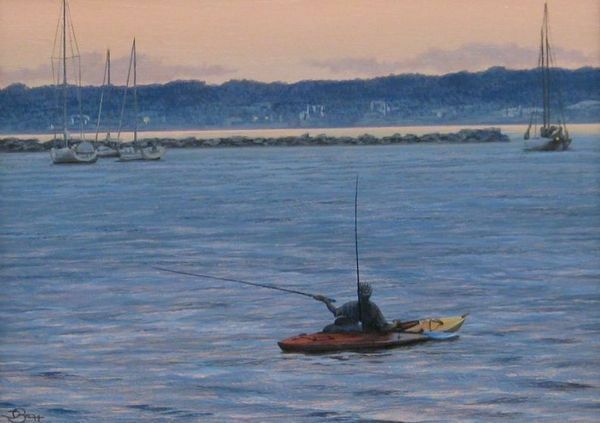 Del-Bourree Bach is a signature member of the American Society of Marine Artists, Society of Animal Artists, National Oil and Acrylic Painters Society, the Salmagundi Club of New York, Audubon Artists, Providence Art Club, and many other professional arts organizations. His works are included in many private, corporate and museum collections, including the Albrecht Kemper Museum in Missouri and the Florence Griswold Museum in Connecticut. His paintings have received over 125 awards in worldwide competition, most recently the newly created Robert Sanstrom Prize and Gold Medal at the 53rd Annual Open Exhibition of the National Society of Painters in Casein and Acrylic. A number of art publications have included feature articles on Del and his work, including American Artist, The Artists Magazine, Watercolor Magic, International Artist and American Art Collector.